Why Choose a Toledo New Bath Tub Liner? Over time, your bathtub might start to darken, get chipped and/or rust. When it’s time remodel, you can refinish, replace OR choose a bathtub liner. Let’s look at some reasons why you should choose a Toledo New Bath tub liner for your bathroom update. Bathtub liners also known as tub liners, acrylic tub liners and tub inserts are made by vacuum forming an acrylic or PVC sheet which is heated then formed in a mold. Bathtub and shower liners are an easy, quick and relatively inexpensive way to update the style of your bathroom. Our liners are custom manufactured to perfectly cover your existing tub. They won’t chip, crack, peel, mildew or rust. The average bathtub should last between 10 and 15 years. You might notice the porcelain start to chip or start of rust. Unfortunately, bathtub refinishing projects can be very expensive - that is why bathtub liner installation might be preferable, according to Angie's List. The most expensive aspect of bathtub refinishing is removal of the existing tub. When you look at your existing tub, you will notice that it is set into your wall with a caulking layer to provide waterproofing properties. Thankfully, experts estimate that a bathtub liner might be one-third the cost of removal of your old tub. No one wants to give up their bathroom for days during a remodel. And what it that turns into weeks? Give us ONE DAY and we’ll give you a new beautiful shower with luxurious new fixtures in your choice of colors and styles – installed by experts at a price you can afford. New acrylic liners leave you with a clean, hygienic surface. Liners are affordable and cost-effective compared to the complete removal of bathtubs. Are there any special features, such as soap dishes in the acrylic bathtub? Yes, you can even select an acrylic bathtub with easily accessible soap dishes. What shapes and sizes are the liners available in? Don’t worry! Your liner will be perfectly fitted with your existing tub. We have two local showrooms where you can try out our products. Come see our high-quality product for yourself. We also offer a FREE in-home inspection to determine what you need. Are acrylic liners durable and tough? Yes, our Toledo New Bath tub liners are impact resistant and, as long as you use approved cleaners, your tub will have a lifetime warranty. Enjoy a perfectly fitted bathtub. You can improve the appearance, hygiene and comfort of your bathroom with an acrylic liner. Bathtub liner installation is the cost-effective solution to an old tub. With over 40 years of experience, Toledo New Bath will be your first and last stop for all your bathroom remodeling needs. 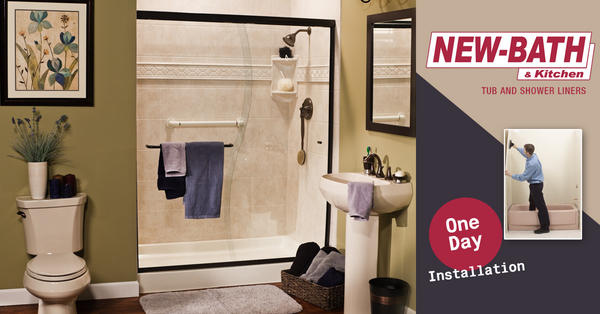 Our Toledo New Bath company is locally owned and operated. Schedule your FREE in-home inspection by calling 419-470-8821 today. We’ll look forward to meeting you!